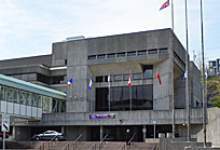 It's easy to connect with the City of St. John's and an increasing number of City services are now offered online for your convenience. Access St. John's is your one-stop spot for city services and includes a 24/7 call centre (phone 311 or 709-754-CITY), and a front desk citizen service centre at City Hall, 10 New Gower Street. You can also submit requests to Access St. John's online. Our online services are right at your fingertips. Online services range from the waste and recycling apps to E-updates and REConnect, the City's online recreation registration system. Connect with the City of St. John's on social media. We're on Twitter, Facebook and Instagram.